So were the words of action sports star Travis Pastrana in an interview with Graham Bensinger, and it’s worth noting how very true it is. Travis Pastrana is, in many ways, the quintessential action sports star; it’s very unlikely his name doesn’t ring a bell, but what exactly he does might elude you, and that’s because what he does changes on a constant basis. He’s never been one to shy away from challenges within and above his ability, racking up an impressive resume of medals and medical bills alike. This is the real thing, racing at Road America. Note the spoiler and hood and trim. And font. And font color. Another shot of the real thing, from Richmond. Note the blank hood and back panel; these never got sponsors. It’s no secret that NASCAR is not a highly respected form of motorsport among many competitors and fans in and of other series. As such, Pastrana often wore a shirt with the letters in the NASCAR logo replaced with BORING; you’ve likely seen that around generic mall merch shops and Amazon stores. A race in late models on a dirt track got him to start changing his mind, as he saw just how chaotic it could get on an oval; soon, he was taking part-time schedules in the Truck and Nationwide (previously Busch, now Xfinity, off-brand name “Grand National”) Series in 2012, and in 2013, he dedicated a full Nationwide season to driving for Roush Fenway Racing. 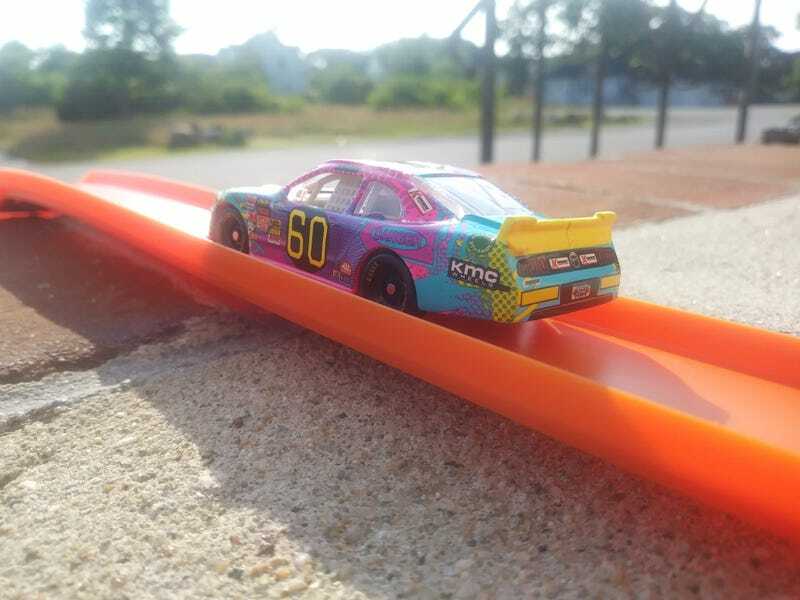 Perhaps it’s fitting for someone of so many hats that out of his brief excursion into a very specialized, demanding form of motorsport, the thing most remembered of it is his car, or rather, his paint scheme. His family had expressed irritation with his stock car races in 2012 due to not being able to spot him in the pack, so he asked RFR for something very loud, very 80's. He wanted something that would stand out from the field. And to his own horror, he got it. Yeah, this is pretty hard to miss. I feel like it’s worth noting how very NOT iconically Pastrana this car his. His number in just about every series that lets him have it is #199; Roush Fenway Racing’s development car is the #60. He didn’t ask for this much pink. He couldn’t stand the firesuit. He never really found success in this car, but it’s still his name emblazoned on it. Let’s talk just the diecast for a moment, though. It’s no surprise this was made; a diecast is bound to hit minimum order when it’s a major racing star in it with enough fans to buy it. But this definitely feels... different. As a matter of fact, it’s almost worth just straight-up calling a fantasy diecast, because there’s a whole lot of wild inaccuracies and additions. It’s nearly a different design altogether. The “RFR DRIVEN” logos are completely made up for the diecast. These never appeared. But why sell a diecast with blank space on it where you could plug your team instead? Pastrana’s 2013 run in the series was a contentious one. For every dramatic scene of him dodging a wreck, finding himself right at home as a talented stunt driver, there were countless more instances where the car just got away from him and he ended up in the wall. It was a completely different discipline with an asphalt focus that he wasn’t entirely prepared for, and the name recognition didn’t entirely travel to the new crowd. They really went hard on the pastel colors on the diecast. Pepto-pink trim. Yellow spoiler. Even “Mustang” is written in a bright blue color; none of these coloration details, nor the star pattern on the hood, made it to the car, but I wonder if they were meant to. Loud and proud as the paint scheme was, it didn’t get filled up much with sponsors, which in a sport like this, puts drivers and teams at a massive disadvantage. Few were willing to make the leap, and even fewer were still willing after seeing that car in pieces a whole lot. I feel like the joke with the doorhandle being printed on is lost a bit when everything is printed on. At the end of 2013, Pastrana called it quits for full-season racing in NASCAR, very hesitantly, but unable to really see another option that still allowed him to spend time with his family and manage his wildly successful Nitro Circus stunt show, especially when not being kept afloat by sponsorships. 33 separate race weekends out of 52 weeks in the year means you really have to be dedicated to JUST the championship and have everything else secondary; that was never really going to work for someone like him. All in all, I highly respect Travis Pastrana. He, to me, is an icon of giving everything a shot, gormandizing a beautiful world of opportunities. He’s challenged Sebastian Loeb to a race and then crashed out before it got to start. He’s put his name and number on a Monster Jam truck. He’s set the record for the Mount Washington hillclimb, twice. He’s not afraid to try and fail, and he’s got plenty of public victories and humiliations alike. He’s still willing to give Truck Series races a go, and shows up in the series sporadically for individual events when there’s an opening. It’s just not his main thing. He doesn’t really have a main thing. You don’t really need one when your main thing is trying everything.